Doctors on the picket line outside the Mater Hospital in Dublin on Monday. THE TALKS BETWEEN the HSE and the Irish Medical Organisation (IMO) over doctors’ hours have been suspended for the night. A spokesperson said that they will resume tomorrow. There was no official word on whether any breakthroughs had been made in the dispute over the number of hours non-consultant hospital doctors (NCHDs) work. Three thousand junior doctors (NCHDs) held a strike on Tuesday in protest at their hours, saying that they want their working week reduced to 48 hours, and want an end to shifts that are more than 24 hours. This morning it was confirmed that the IMO would attend the Labour Relations Commission (LRC) in order to hear what the HSE had to say about sanctions and other issues. It added that the day of action “demonstrated the huge level of public support for our campaign”. It said that the ball “is now in their (HSE’s) court if they wish to avoid an escalation of the dispute”. 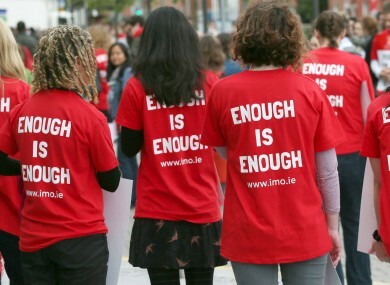 The invitation to talks at the LRC came after a letter was sent to the IMO by the HSE accepting the need for sanctions to enforce rules on working hours. Email “IMO and HSE talks suspended for the night”. Feedback on “IMO and HSE talks suspended for the night”.